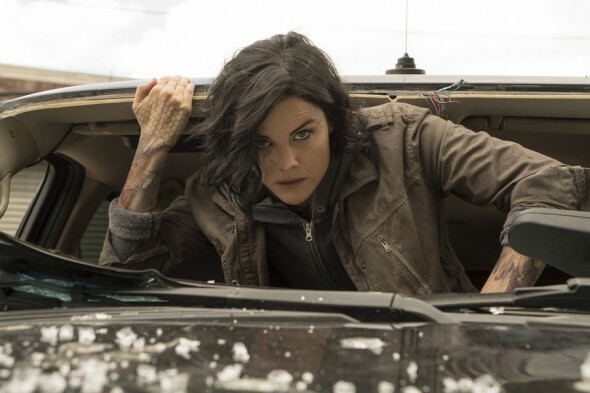 As reported earlier, the new Blindspot TV show on NBC is the first TV show of the Fall 2015-16 season to receive an order for nine additional episodes. NBC has picked up the back nine episodes of the first season of “Blindspot,” the Monday 10 p.m. ET drama that has scored as the fall season’s #1-rated new series in adults 18-49. Through three weeks, “Blindspot” has averaged a 2.7 rating, 9 share in adults 18-49 and 9.6 million viewers overall in “live plus same day” results from Nielsen Media Research, and the show’s first two telecasts have each grown by 4.6 million viewers in “live plus three day” Nielsens, in both cases the biggest increases for those weeks among all broadcast and cable programs. “Blindspot” involves the mystery of a beautiful woman, with no memories of her past, who’s found naked in Times Square with her body fully covered in intricate tattoos. Her discovery sets off a vast and complex mystery that immediately ignites the attention of the FBI, who begin to follow the road map on her body to reveal a larger conspiracy of crime while bringing her closer to discovering the truth about her identity. What do you think? Do you like the Blindspot TV show on NBC? Do you think it will continue to do well or, could it be cancelled before the send of the season?